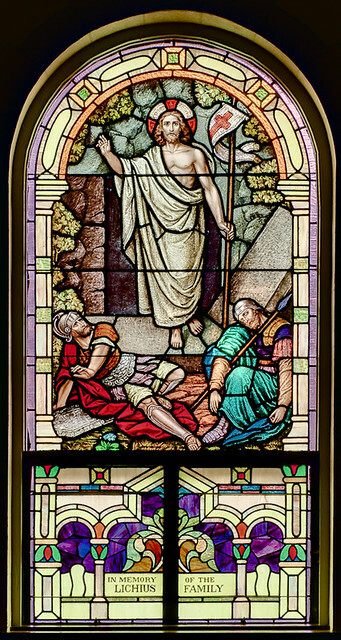 Stained glass window of the Resurrection, at Holy Cross Catholic Church, in Cuba, Missouri. It is truly fitting and just to proclaim with all the affection of our heart and soul, and with the sound of our voice the invisible God the Father almighty, and his only Son our Lord Jesus Christ. Who paid for us to his eternal Father the debt of Adam: and by his sacred blood canceled the guilt contracted by original sin. 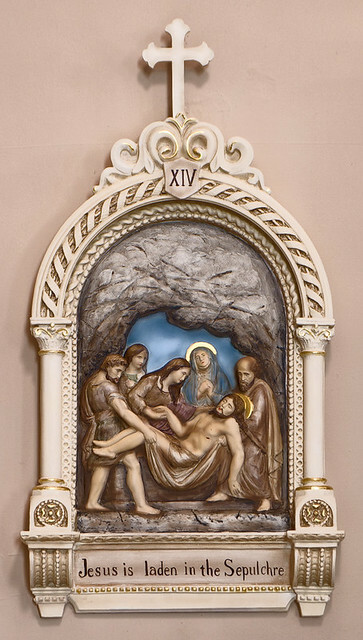 For this is the Paschal solemnity, in which the true Lamb was slain, by whose blood the doors of the faithful are consecrated. This is the night in which thou formerly broughtest forth our forefathers, the children of Israel, out of Egypt, leading them dry-foot through the Red Sea. This then is the night which dissipated the darkness of sin by the light of the pillar. This is the night which now delivers all over the world those that believe in Christ from the vices of the world and darkness of sin, restores them to grace, and clothes them with sanctity. This is the night in which Christ broke the chains of death, and ascended conqueror from hell. For it availed us nothing to be born, unless it had availed us to be redeemed. O how admirable is thy goodness towards us! O how inestimable is thy love! Thou hast delivered up thy Son to redeem a slave. O truly necessary sin of Adam, which the death of Christ has blotted out! O happy fault, that merited such and so great a Redeemer! 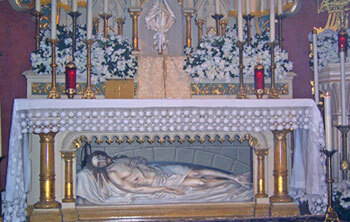 Jesus is laden in the Sepulchre, at Saint Patrick Church, in Grafton, Illinois. Photo taken in October, 2010. God is dead. We killed Him. He is in hell because of us. 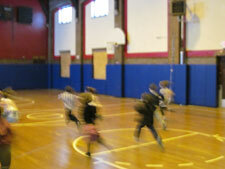 All of the men turned and fled, in fear of their lives; only the women — and one boy — had the courage to remain. Imagine how the disciples might have felt on that first Holy Saturday: lost, betrayed, confused, fearful, distrustful, full of doubt, full of rage. Was their faith in vain? To whom shall they go? But their shepherd was killed, and one of their own betrayed Him. Surely His mother Mary knew better? 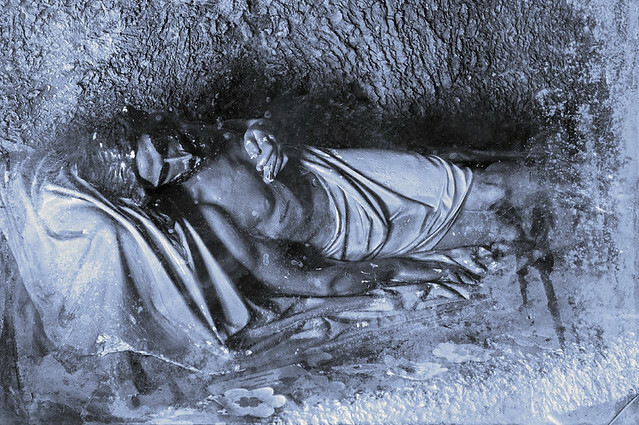 Christ in the tomb, at Shrine of Our Lady of Sorrows, in Starkenburg, Missouri. Photo taken in February 2012. But we are told that Christ had a new flock to minister to, those who had gone before us, all the souls of the righteous who were waiting in the darkness of Hades. 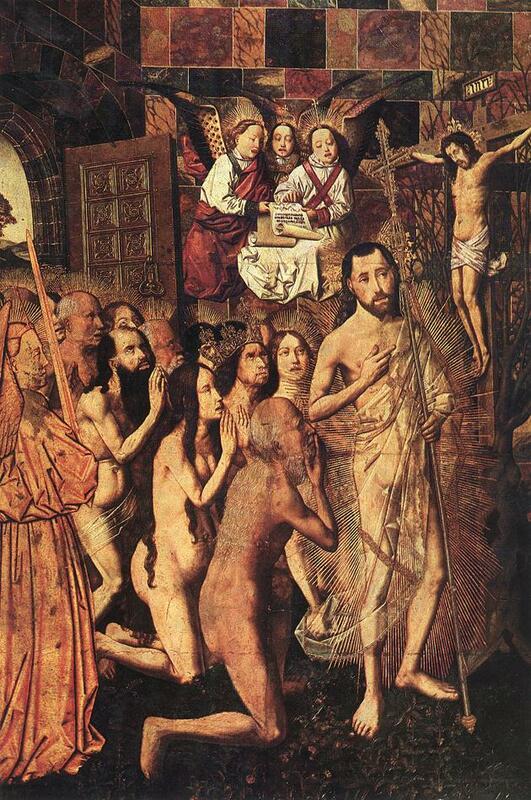 Iconography of the ‘Harrowing of Hell’ for Holy Saturday shows Christ, triumphant, rescuing these souls, including Adam and Eve, who got us into this predicament. GOOD FRIDAY, the most solemn and bleak day of the liturgical year, a day of bitter darkness, for we have crucified Our Lord, and so are guilty of the crime of Deicide. During the Office of Tenebrae, the readings warn us impending chastisement and destruction, due to our evil, unrepentant ways, particularly in the books of the Old Testament prophet Jeremiah, and in the choice of Psalms. Over the course of the liturgy, the many candles we find near the altar are snuffed out, one by one, symbolizing this greatest of crimes, increasing our fear of just judgement upon us. Do we really want justice? Rather, we should tremble with fear knowing that true justice would require a severe punishment that we could not bear. 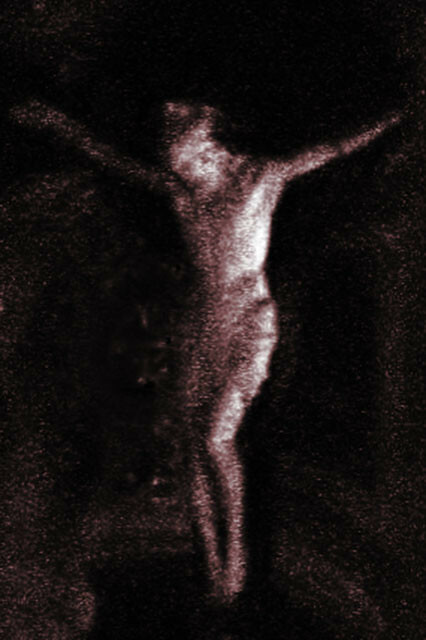 Crucifix, depicting Christ dead on the cross, at the Cathedral Basilica of Saint Louis, illumined by the flame of a single candle, after the office of Tenebrae for Good Friday. There was hardly any light to take a photograph, and so this photographic image itself is battered and ugly. Your wickedness will chasten you, and your apostasy will reprove you. Know and see that it is evil and bitter for you to forsake the Lord your God; the fear of me is not in you, says the Lord God of hosts. Yea, upon every high hill and under every green tree you bowed down as a harlot. Yet I planted you a choice vine, wholly of pure seed. Why do you complain against me? You have all rebelled against me, says the Lord. In vain have I smitten your children, they took no correction; your own sword devoured your prophets like a ravening lion. And you, O generation, heed the word of the Lord. Have I been a wilderness to Israel, or a land of thick darkness? Why then do my people say, ‘We are free, we will come no more to thee’? Can a maiden forget her ornaments, or a bride her attire? How well you direct your course to seek lovers! So that even to wicked women you have taught your ways. Also on your skirts is found the lifeblood of guiltless poor; you did not find them breaking in. The Lord has destroyed without mercy all the habitations of Jacob; in his wrath he has broken down the strongholds of the daughter of Judah; he has brought down to the ground in dishonor the kingdom and its rulers. That will never happen to us, we believe. But we forget that the ‘unintended consequences’ of our sins serve to punish us also: “Your wickedness will chasten you, and your apostasy will reprove you.” We break the laws of God, of our human nature, and of our relationship with Creation, and are surprised that this does not make us happy, but rather miserable. And so we create new laws, systems, technologies, and propaganda campaigns to overcome these, which leads to more consequences that lead to greater misery. Be appalled, O heavens, at this, be shocked, be utterly desolate, says the Lord, for my people have committed two evils: they have forsaken me, the fountain of living waters, and hewed out cisterns for themselves, broken cisterns, that can hold no water. In the Office of Tenebrae, the candles are snuffed out one by one, until the final candle, representing Christ, is taken away for a while. Our Lord has been taken away and it is our fault. But the candle is brought back while it continues to burn. This tells us that while we ought to tremble in fear of God’s justice, we still have a glimmer of light to give us hope. Ierusalem, Ierusalem, convertere ad Dominum Deum tuum! Jerusalem! Jerusalem! Return to the Lord your God! 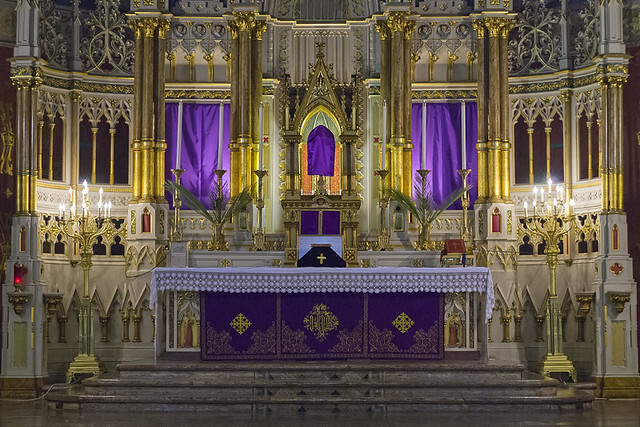 High altar at Saint Francis de Sales Oratory, in Saint Louis, Missouri; decorated for Palm Sunday. 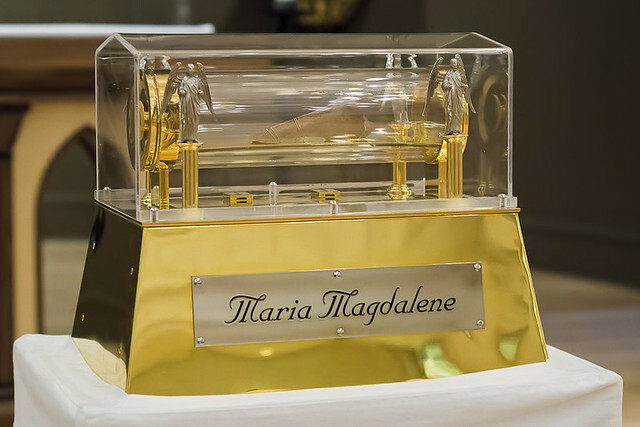 A RELIC OF SAINT Mary Magdalen was venerated last week at both Magdalen churches in the Archdiocese, and also at the new Dominican Priory in Saint Louis. Fragment of a tibia. Saint Mary Magdalen is one the great Saints of the early Church, as evidenced by her titles of Equal-to-the-Apostles, and Apostle-to-the-Apostles, among others. This was taken at Saint Dominic Priory in Saint Louis. In thankgiving for the election of His Holiness, Pope Francis, the clergy and faithful sang the Te Deum after Mass last Sunday. The Te Deum is the great hymn of thanksgiving attributed to Saint Ambrose, a fourth century Doctor of the Church. We offer our new Holy Father our prayers, as he begins his Petrine Ministry. Viva il Papa! "But our mother [Holy Mother Church] asks something more of us than compassion and tears; she would have us profit by the lessons we are to be taught by the Passion and Death of our Redeemer. He Himself, when going up to Calvary, said to the holy women who had the courage to show their compassion even before His very executioners: 'Weep not over Me; but weep for yourselves and for your children.' It was not that He refused the tribute of their tears, for He was pleased with this proof of their affection; but it was desired, above all, to see them appreciate the importance of what they were witnessing, and learn from it how inexorable is God's justice against sin." --Dom Gueranger, Liturgical Year. Since their creation from the loving hands of God, the angels have worshiped and adored Him. In the heavenly liturgy, they minister before Him and offer the prayers of Christ’s faithful before the throne of the divine majesty. “And the smoke of incense of the prayers of the saints ascended up before God from the hand of the angel.” (Apocalypse 8:4) Angels are purely spiritual beings, and therefore cannot be perceived by the senses. We know by faith that they are there adoring our Lord, but like many things that we cannot see, we easily forget this. Therefore Holy Church, since time immemorial, has utilized the arts to make the invisible visible and to bring the divine realities closer to us. 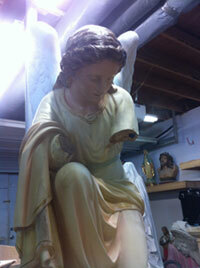 Often times we find in churches images of angels in adoration near the Blessed Sacrament altar. 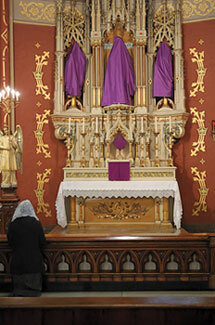 They are there to remind us of the presents of angels and our own duty to adore God. 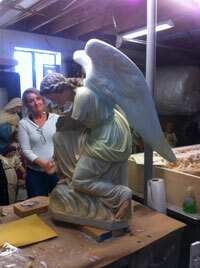 Many years ago, a pair of adoring angel statues was given to Saint Francis de Sales parish. They were in need of repair and sent to a local company for refurbishing. However they were then forgotten, and the years passed by. Today, with the charitable help of generous benefactors, we are happy to announce the triumphant return of these beautiful works of art to St. Francis de Sales Oratory. 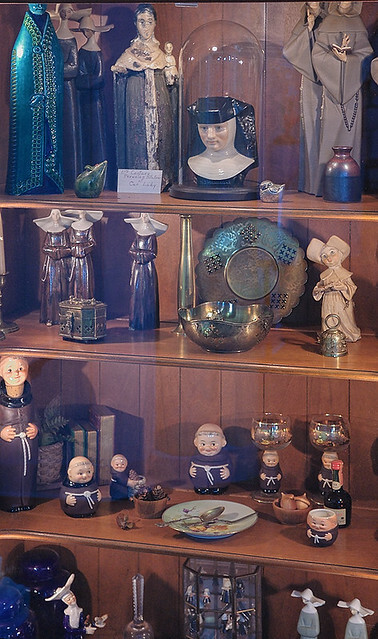 About 5 years ago, these statues were discovered by accident while looking for other liturgical items at Restoration Plus. According to records they were sent there by a previous pastor of the former parish for repairs in the early 1990s and never retrieved. We are truly thankful to Ms. Michelle Bowman-DuMey for her expertise and long hours of dedicated work to truly bring these pieces back from a state of disrepair. Phil Roussin and Phil Winslow finished the repainting of the Co-op entrance to the 1888 building. Painting the walls and woodwork in the Rectory basement has been an on-going improvement project undertaken by Chris Koziatek, who has been devoting many Saturdays to this effort. In the church hall, Phil Roussin and Chris Petersen have wired and installed a media facility in the stage area with projector, sound and screen to show videos and movies via computer. 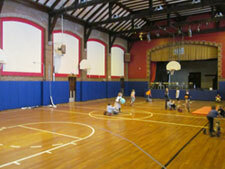 Our charter school tenant, KIPP, through a funding grant, has provided padding in the gym along the walls and columns to improve safety for the children’s activities. The much needed tuck-point work on the steeple is scheduled to start as soon as the threat of freezing weather has passed. 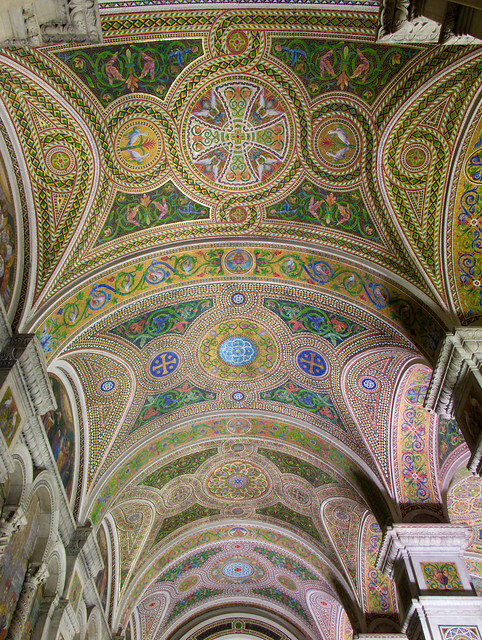 A recent development is the roof leak in the church near the south confessional. We have had a restoration company investigate the origin of the leak and they have promised an expedited repair, since the ceiling plaster has been damaged. Wishing a blessed Holy Week and Easter! 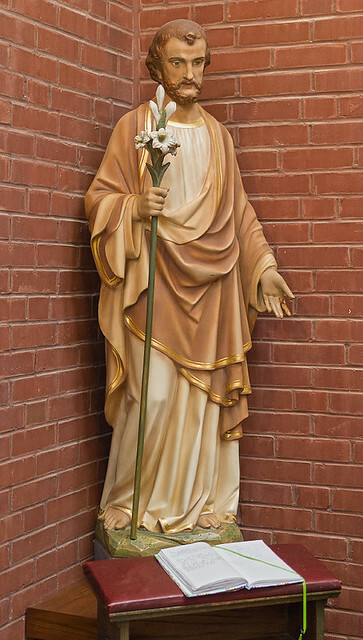 YESTERDAY, on the Feast of Saint Joseph, I visited Saint Joseph Church in Clayton, Missouri. This century-old church building serves the oldest parish in central Saint Louis County, dating from 1842. Built atop the highest hill in once-rural Clayton, this church now has tall office buildings as neighbors. 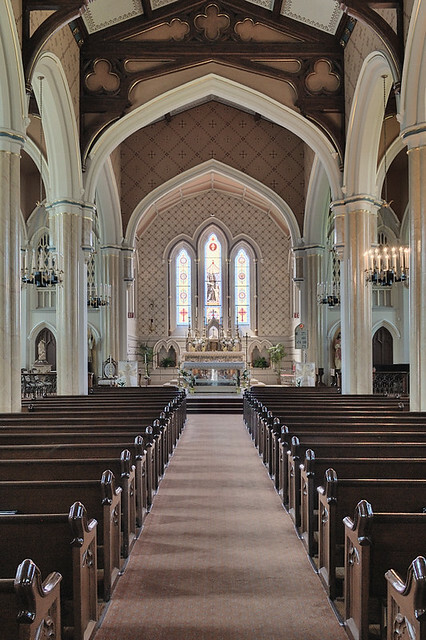 Once the parish of French pioneers and their descendants and Irish immigrants, this now-urban parish is noted, among other things, for having well-attended weekday noon Masses and devotions, along with daily confession. 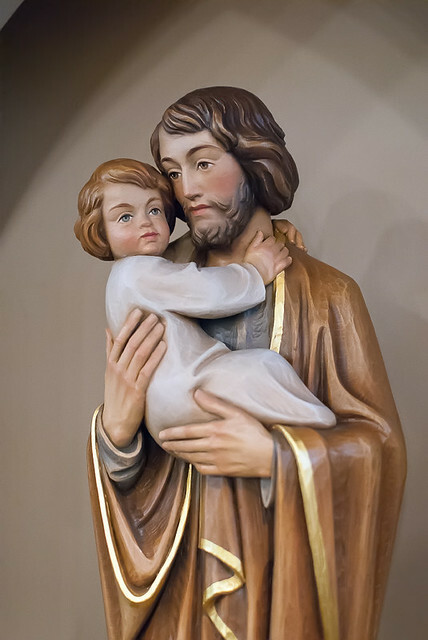 Here are some photos of statues and images of Saint Joseph, foster-father of Our Lord and patron of the Universal Church. 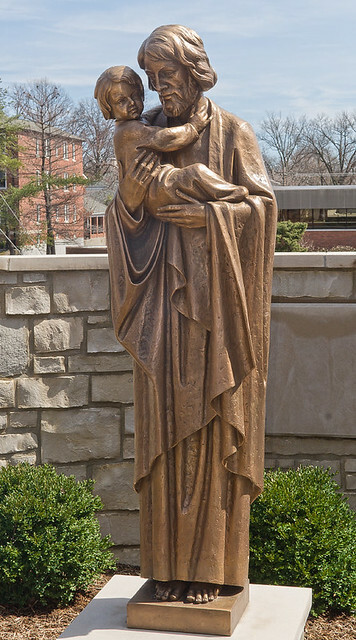 This bronze statue of Saint Joseph and the Christ child was cast in 2011, by Ivo Demetz. 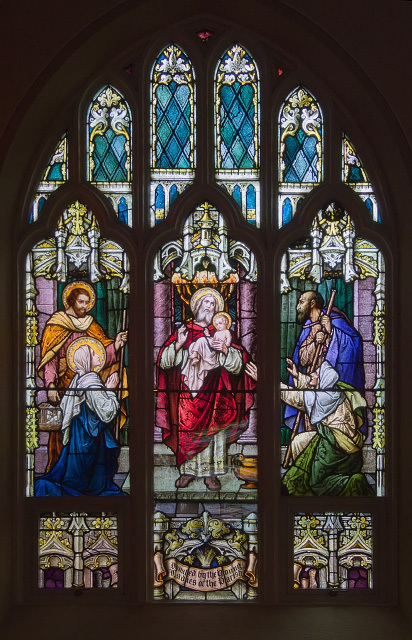 The original Greek texts of the Gospels tell us that Saint Joseph was a τέκτων (or tekton), and he trained his adopted son Jesus in the same trade. 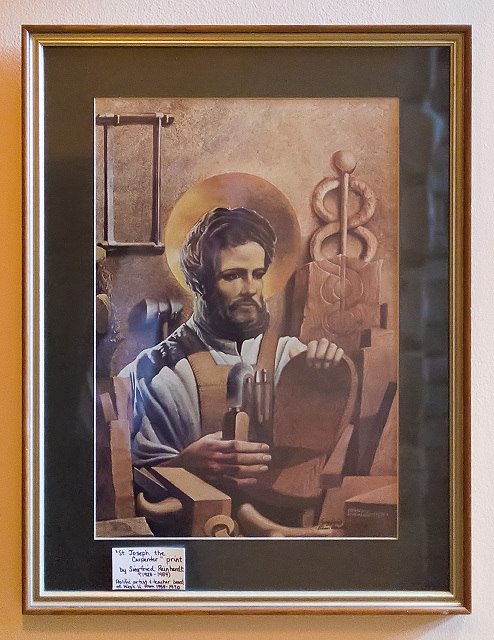 Tekton is a general term for craftsman or builder, and from tekton we get our words ’technology’ and ‘architecture.’ However, Saint Justin Martyr tells us Jesus made yokes and plows, and the early tradition says that Joseph specifically was a carpenter. This charming statue was carved from linden wood by the Demetz Art Studio, in Ortisei, Italy. 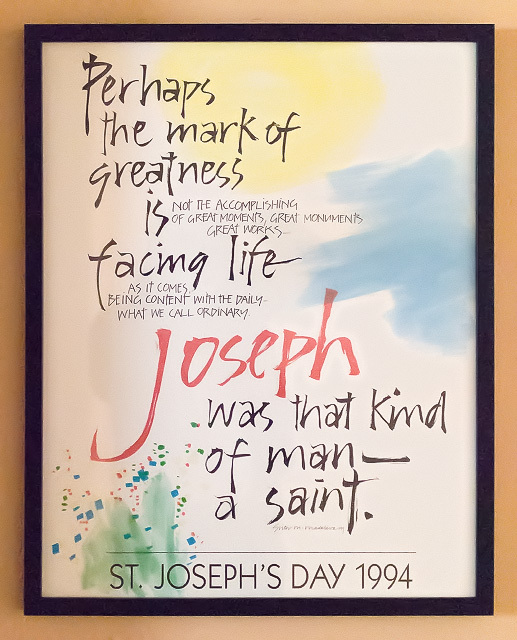 A Saint Joseph’s Day poster from 1994. While at the church, I got a copy of the book, “The Cross Planted in Clayton: A Centennial History of St. Joseph Catholic Church,” a new book, by the Rev. Msgr. John B. Shamleffer, JCL, which covers the history of the parish and architecture of the church. 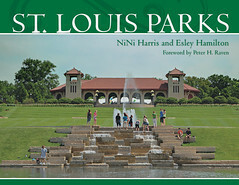 This book is available for sale at the churches rectory: 106 North Meramec Avenue, Clayton, Missouri 63105, at a cost of $35. I contributed a number of photographs for this book. Press Conference with Archbishop Carlson about the election of Pope Francis. The Archbishop of Saint Louis, the Most Rev. Robert Carlson, with the V. Rev. Douglas W. Marcouiller, Provincial of the Missouri Province of the Society of Jesus. 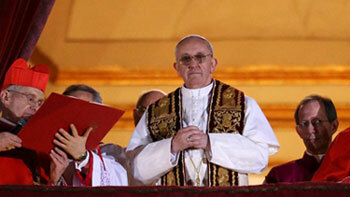 POPE FRANCIS, Jorge Mario Bergoglio of the Society of Jesus, age 76, Archbishop of Buenos Aires, Argentina. O God, who in your providential design willed that your Church be built upon blessed Peter, whom you set over the other apostles, look with favor, we pray, on Francis, our Pope, and grant that he, whom you have made Peter’s successor, may be for your people a visible source and foundation of unity in faith and of communion. From Vatican Radio, in English. While no photos will be taken within the conclave, the election being secret, you can view an interactive, spherical panoramic photograph of the 500 year-old Sistine Chapel, where the voting will be taking place, here. 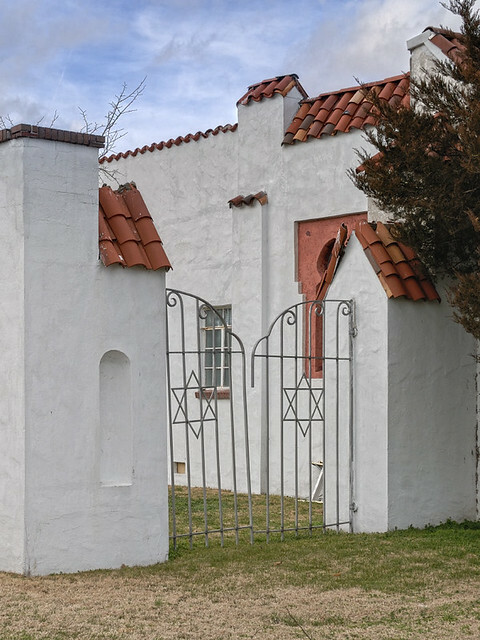 NEXT DOOR TO the old Saint Vincent de Paul Church, in Cape Girardeau, Missouri, is the former B’Nai Israel Orthodox synagogue, constructed in 1937, and made in a Spanish Colonial Revival style with Moorish elements. 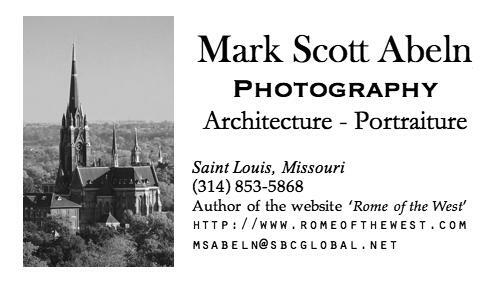 This building was designed by the Saint Louis architect Thomas P. Barnett Jr. who also designed other buildings in Cape Girardeau: he came from a prominent family of architects, his father having designed the Cathedral Basilica of Saint Louis. Reportedly, this synagogue has not been altered since its construction, and the interior remains intact. 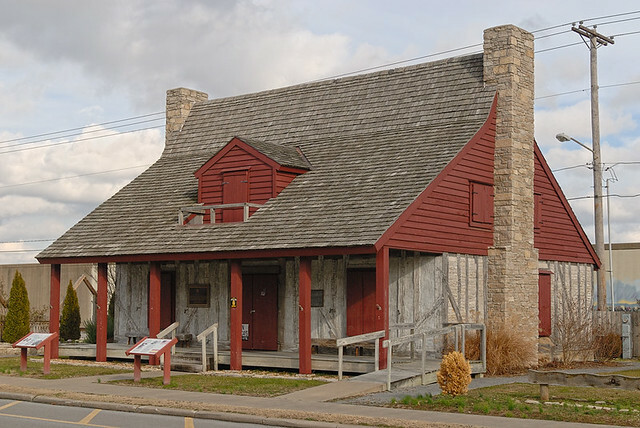 You can read its nomination for the National Register of Historical Places here. 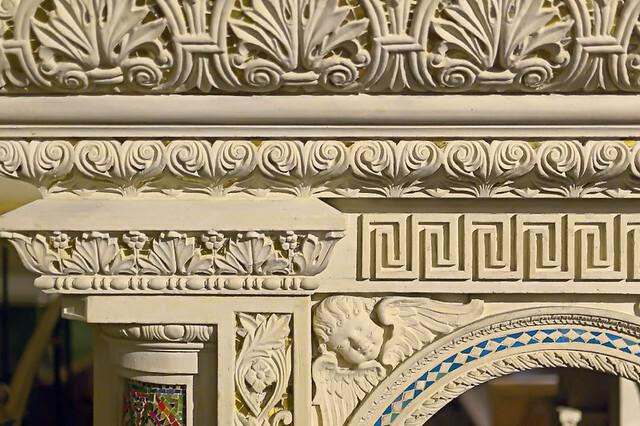 While we might consider such a style of architecture to be more Islamic than Jewish, understand that the history and art of Spain, which inspired this building, is complex and non-intuitive to those of us more familiar with northern European styles. 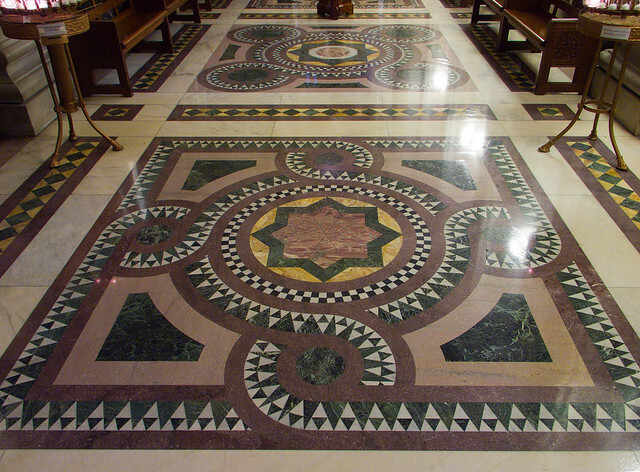 The New Liturgical Movement tells us of a similarly-decorated ancient Catholic church, in the article Mozarabic Potentialities for Contemporary Church Architecture? 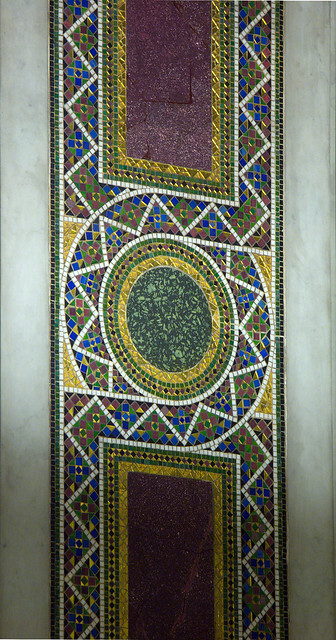 This style is largely derived from the arts of the late Roman and Byzantine Empires, and in turn, it inspired the Gothic. The synagogue closed because the congregation was unable to maintain a quorum for licit liturgies; this in turn was due to the changing economy (most congregants owned their own businesses, but were unable to compete with the suburban malls), and most critically, because of the inability of the youth to find suitable spouses in the region. You can read about its history here. 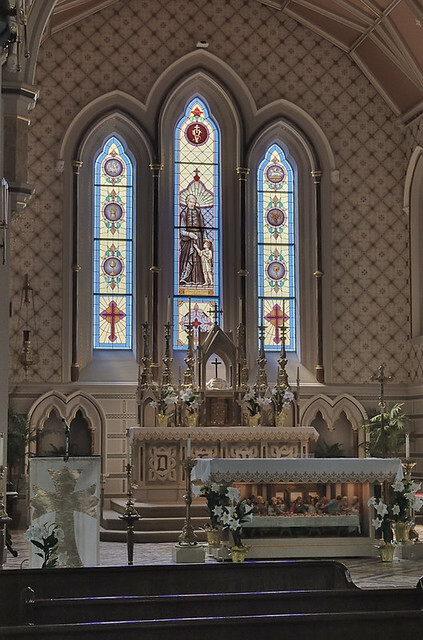 HERE ARE PHOTOS of the old Saint Vincent de Paul Church, in Cape Girardeau, Missouri. A part of the Diocese of Springfield-Cape Girardeau, this is now a chapel of ease in the historic riverfront district of that city. 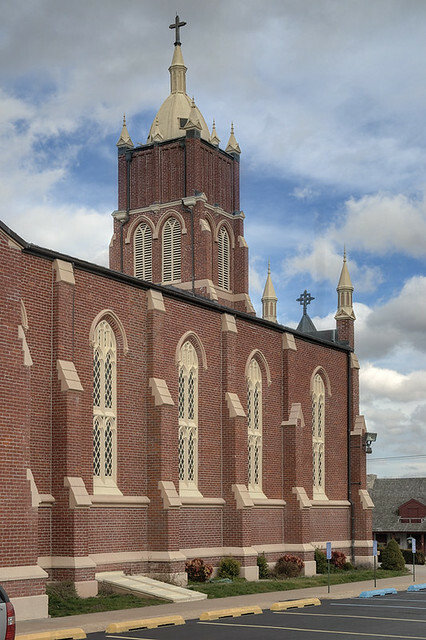 Dating from 1853, this English Gothic Revival church is located about 115 highway miles south of downtown Saint Louis. 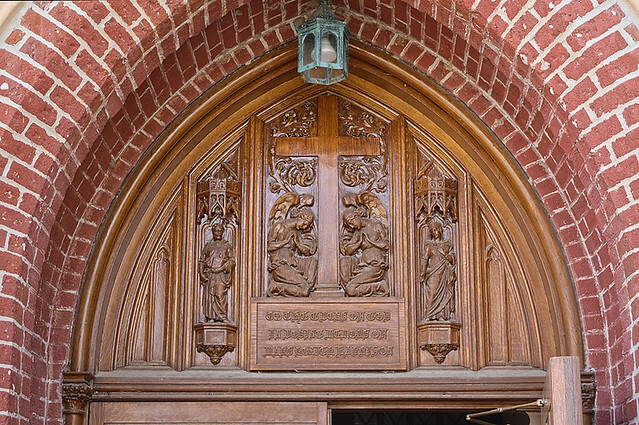 Wood carving over the main entrance. 1825: Fr. John Timon, A Vincentian priest, was assigned to serve the population of Perry & Cape Girardeau counties. July 8, 1833: Fr. Timon celebrated Mass in the first temporary church which was a warehouse of Don Louis Lorimier. It was close to the riverfront and near to the Red House, Lorimier's home. April 30, 1838: Cornerstone of the first church was laid by Bishop Joseph Rosati, C.M. This stone structure distinctly resembled the Old Cathedral on the St. Louis riverfront. 1850: First church of native stone destroyed by a violent tornado. foundation. The church was designed by a noted Missouri architect, Thomas Warying Walsh. The church is in the style of Renaissance architecture in which architects refer to the style of the church as English Gothic Revival. 1900: A spire of undetermined height was erected on the occasion of the golden jubilee. 1905: The spire was struck by lightning. 1912: Lightning again strikes the spires and it was destroyed by fire. The present steeple was constructed in 1912. 1926: The vestibule at the front entrance was added sometime after 1900. The shape of the church is cruciform; shape of a cross. 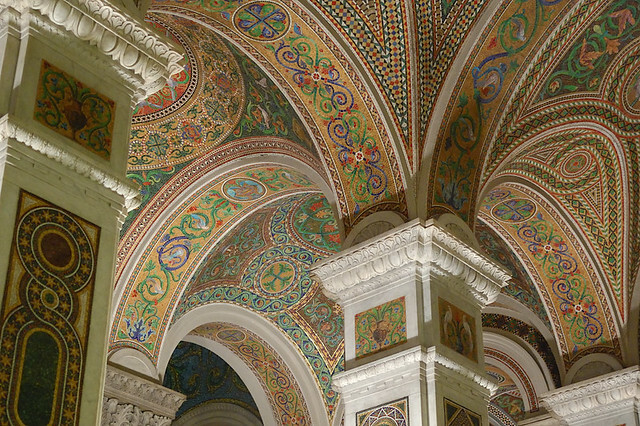 There are nine arches intertwined in the choir loft. Architects' speculation is that the arches were designed to support the tall spire in the original design. Pews show evidence of originally having gates (doors) as well a partitions. There was a pedestal which gave evidence of a pulpit near the front of the church. December 1977: Old St. Vincent Church was declared a Chapel of Ease. Restoration begins. It has remained a place of worship since Father Timon came to this area in 1833. 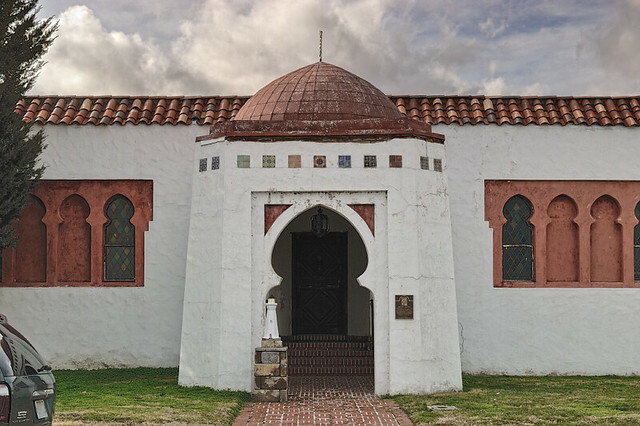 April 1982: Old St. Vincent Church was placed on the National Register of Historic Places. 1997: Exterior and interior restoration completed. 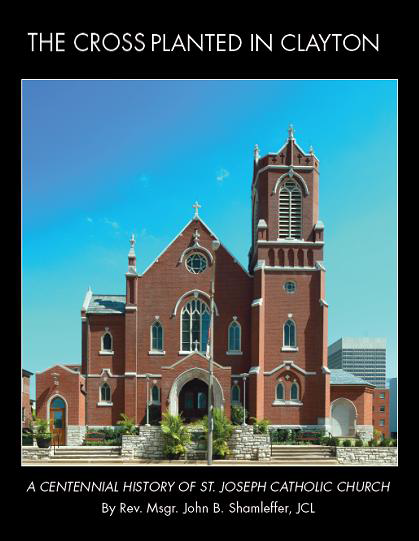 Present: Old St. Vincent Church continues to serve the Cape Girardeau community as a Religious & Cultural Center. Fr. 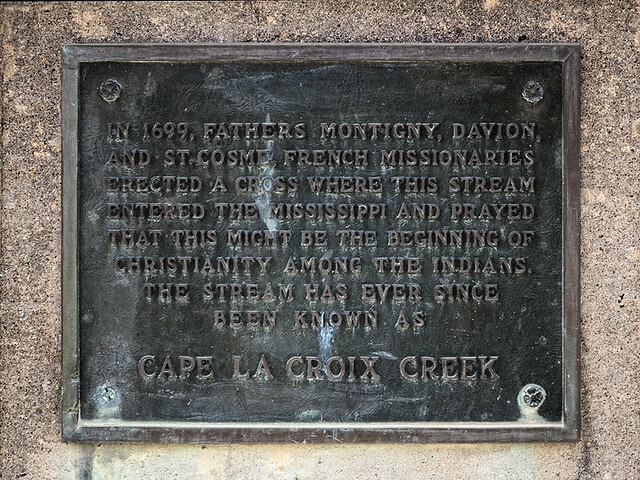 Timon, the first parish priest, was a missionary along the Mississippi River and in Texas, and later became Coadjutor Bishop of the Diocese of Saint Louis, then Apostolic Prefect of the Republic of Texas, and then Bishop of Buffalo. 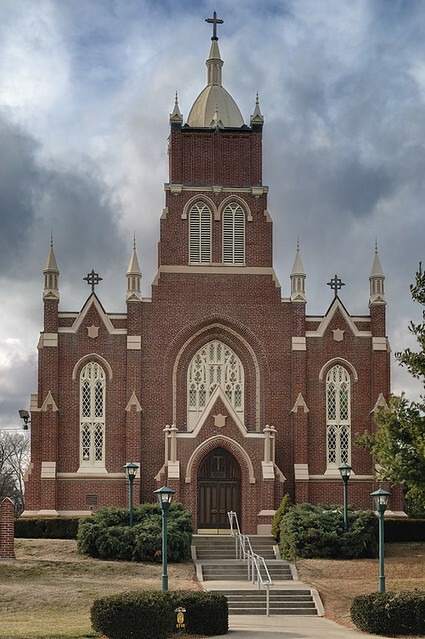 The architect Walsh, who was born in Kilkenny, Ireland, and lived in Saint Louis, also designed the old Cathedral (Saints Peter and Paul) in Alton, Illinois, Du Bourg Hall and Saint Francis Xavier Church at Saint Louis University, and Saint Alphonsus Ligouri Church in Saint Louis. 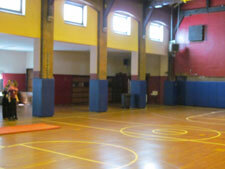 These interior photos were taken in April of 2012. The old high altar. Deus is Latin for God. 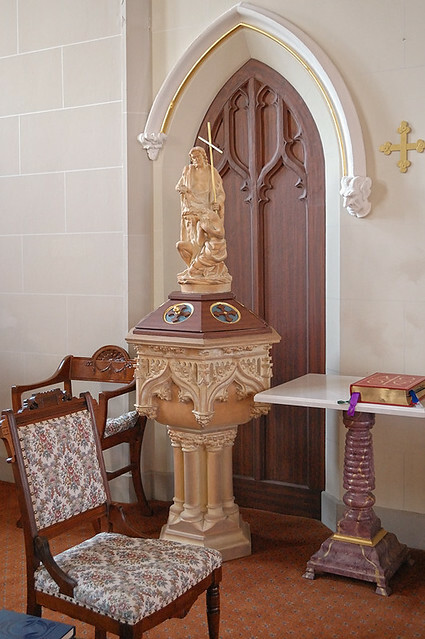 Baptismal font, with sculpture depicting the baptism of Our Lord in the Jordan River by Saint John the Baptist. 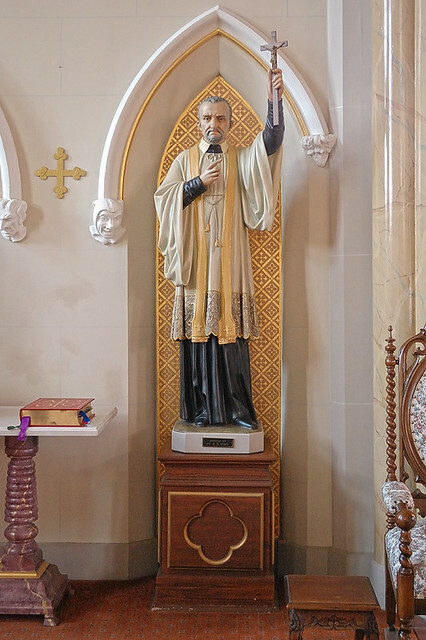 Statue of Saint Vincent de Paul. He was a French priest, ordained in the year of Our Lord 1600. Captured by pirates, he was sold into slavery but later assisted in the reversion of his apostate master, and succeeded in freeing himself and his fellow slaves. While he was a friend of kings and aristocrats, he worked especially with poor peasants, convicts in slave galleys, and spiritually supporting his fellow priests. He was founder of the Ladies of Charity, co-founder, with St. Louise de Marillac, of the Daughters of Charity, and founded the Congregation of the Mission. This monument is near the church. The former B’Nai Israel Synagogue, which has an unusual Spanish-Moorish design, is located next door to the church. MARY MAGDALEN — whose titles include Myrrhbearer, Equal of the Apostles, and Apostle to the Apostles — is not only famed in the New Testament, but also, according to tradition, was a missionary to the Roman province of Gaul, or modern-day France. Painting of Saint Mary Magdalen, at the Saint Louis Art Museum. 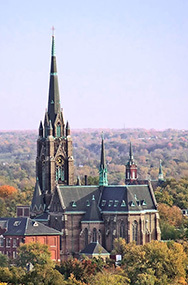 • St. Mary Magdalen, 4924 Bancroft Ave. in south St. Louis; 7:50 a.m. candlelight procession carrying the relic into the church, followed by Mass; 9:15 a.m. Chaplet and Litany; 9:30-10:30 a.m. spiritual talk; 11:30 a.m. Mass; 1 p.m. relic departs. Call (314) 352-2111. • St. Mary Magdalen, 2618 South Brentwood Blvd. in Brentwood; 2 p.m. candlelight procession carrying the relic into the church; 2:15-3 p.m. Confessions, followed by Mass; 4-6 p.m. Confessions; 4:30 p.m. Chaplet and Litany; 5 p.m. Rosary; 5:30-6:30 p.m. 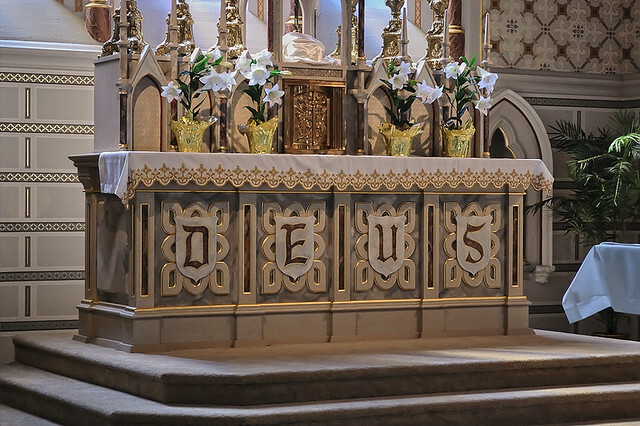 Blessed Sacrament exposed for spiritual talk, followed by 7 p.m. Mass; relic departs at 8 p.m. Call (314) 961-8400. • St. Dominic Priory, 3407 Lafayette Ave. in St. Louis; 8 a.m. Morning Prayer with preaching; 11 a.m. Mass, with veneration throughout the day; 2 p.m. Rosary or Chaplet to St. Mary Magdalene; 4:30 p.m. Evening Prayer with preaching. Call (314) 678-9427 for more information.